Work: Land attorney; High Sheriff of Essex County, NJ. ; Member of New Jersey Provincial Congress; Elected to the Continental Congress, 1776 ~1784. Abraham Clark was born into the life of a farmer at what is now Elizabeth, New Jersey. His father saw an aptitude for mathematics and felt that he was too frail for the farm life and so young Abraham was tutored in mathematics and surveying. He continued his own study of the Law while working as a surveyor. He later practiced as an attorney and in this role is said to have been quite popular because of his habit of serving poor farmers in the community in cases dealing with title disputes. In succeeding years he served as the clerk of the Provincial Assembly, High Sheriff of Essex (now divided into Essex and Union) County. 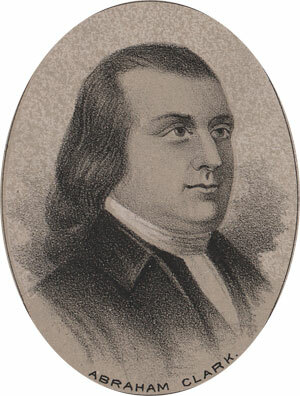 Elected to the Provincial Congress in 1775, he then represented New Jersey at the Second Continental Congress in 1776, where he signed the Declaration of Independence. He served in the congress through the Revolutionary War as a member of the committee of Public Safety. He retired and was unable to attend the Federal Constitutional Convention in 1787, however he is said to have been active in community politics until his death in 1794. Clark Township, New Jersey, is named in his honor.